As parents of children with special needs, who are also choosing to homeschool, we have some unique challenges. On top of these challenges, we are also not spared the normal trials that come to us as a part of our earthly lives. 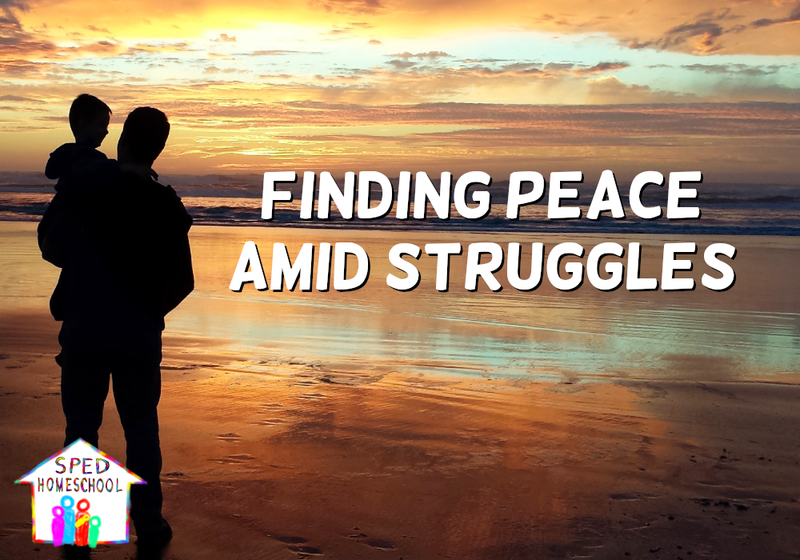 As I have been struggling with a seemingly endless barrage of these challenges this year, I have been on a journey of finding peace in the midst of these struggles. We learn in John that the peace offered to us by the Savior is not the same as the peace offered to us by the world (14:27). The world would gain peace by erasing hardships and never struggling. Their vision of peace is based on external factors and the impact those factors have on their life. It does not take very careful scrutiny to see why peace like this is going to be shallow and fleeting. We have no control over many of the troubling things that happen in this world or even in our own lives. While we can minimize negative consequences of actions, we cannot avoid hardships. So then what is peace? As I pondered this, I was guided to a scripture in 2 Corinthians 4:8-9. As I read that scripture, I knew that is where I wanted to be. I had for too long been letting my troubles, confusion, and persecution turn into despair. Feeling forsaken and hopeless I had been ascribing to the faulty thinking that if my faith was strong enough, then I wouldn’t have to feel so confused and troubled by the things happening in my life. Peace is not the absence of external hardships, but rather a “well springing up inside of us” (John 4:14) that sustains us, no matter what is happening around us. Sometimes we will feel confused and perplexed and cast down, but that does not mean we have to lose that peace and let those feelings turn into hopelessness and despair. When we feel consumed with darkness in our lives, we can turn to the ultimate “light of the world” (John 8:12) who will fill our hearts and souls up with that light. Because He “trod the winepress alone” (Isaiah 63:3), we do not have to. When the source of our peace is The Prince of Peace, nothing can take that away from us.